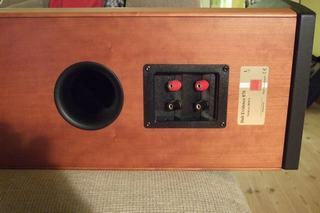 Thorbjørn is a younger guy that has a big interest in both stereo and surround. For more than a year he has owned a DCN23 / PSU DCN to filter his Tymphany LAT 500 subwoofers driven by his huge Vincent SAV- P200. The time had come to make new improvements - so he contacted me about the possibilities of activating his Dali Evidence 870. Thorbjørn have had the Dali speakers for about 6 years and he is a fan of multi-way speakers in the Dali range of loudspeakers - Dali Grand is the favourite. Anyway based upon his experience with the DCN23 - he decided that active was the thing to do before replacing the loudspeakers - probably more to gain. 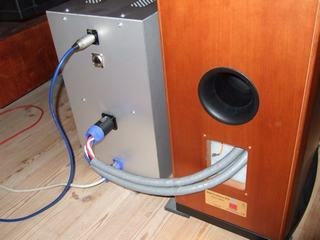 I were able to offer him two Chassis 603 to make the transition as easy as possible - he only had to switch the connector plate on the back of the Dali speakers to a plate with an 8-pol SpeakOn connector and cabling to each of the drivers. 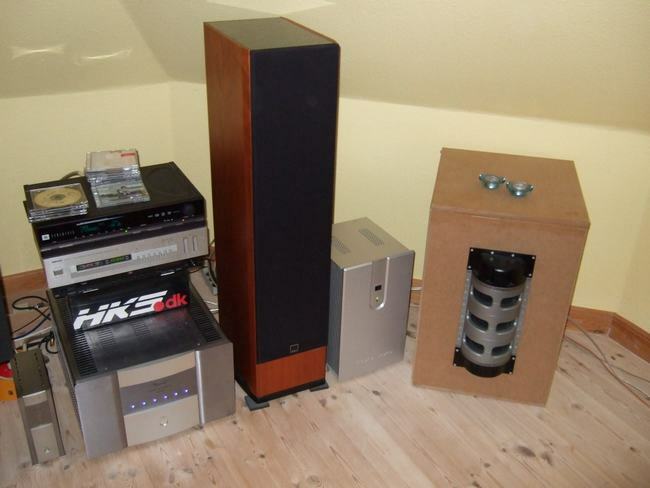 Thorbjørn's system under the comparison test - "passisve versus active"
I bought the two amplifiers from Robert and the upgrade of my Dali's could begin. 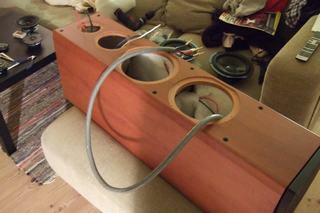 I dwelled for a moment - those speakers sure are nice, but soon everything was taken apart. It was actually pretty easy. 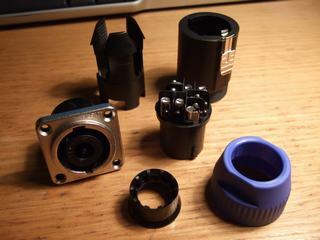 I chopped my Taralabs Prime 1000 in half using them as internal wiring. 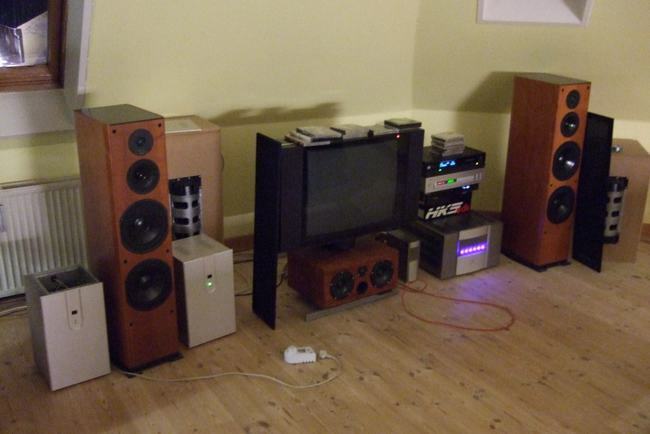 A little overkill some may say, but the old cables has low value on the second hand marked and I would not need heavy cables outside the speakers anymore, since they was going to become active now. 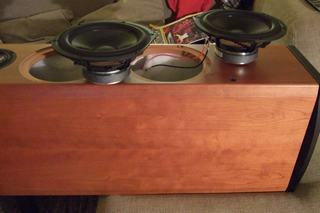 Short after I did the same thing to the right speaker. And again WOW!! Now for the first time ever in any of my setups, the sound now had a rock solid deep sound stage and stereo perspective beyond my dreams. Bass reproduction was now agile and detailed, which gave music a never before heard, fantastic rhythm. And that midrange suddenly became alive. Horns, voices and string-instruments were no longer boring and muffled listening to. 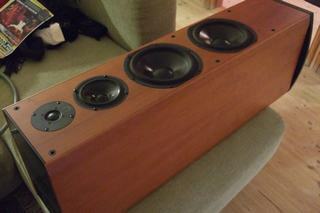 My old Dali's look the same, but sound so enormously different - Perfect!! Still some adjusting to do though, but the XOverWizard makes that easy Active amplifier solutions like this, is definitely the way to go, if you don't want to be locked down by expensive and boring standard consumer products, with low upgrade potential ! !